Unfortunately, Anabolicum Vister (Quinbolone) wasn't very popular in the United States, and most of the research on it was written in Italian. Why is that important? Well, most of the research on it is written in Italian. I'm one of those guys who doesn't even like to read the menu out loud at an Italian restaurant I usually have to point at the item I want to avoid looking too stupid. Anabolicum Vister is yet another attempt at creating a steroid with the basic idea of altering the Methandrostenolone/Boldenone structure. As we already know, Equipoise (Boldenone) is basically a non-17alpha alkylated version of Dianabol, with an Undeclynate ester added. 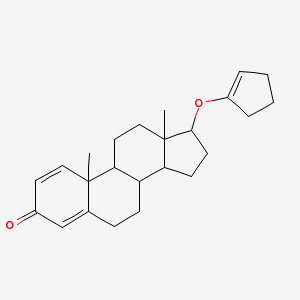 What we're looking at in Anabolicum Vister (Quinbolone) is basically Eq or Boldenone but with a cyclopentenyl ester at the 17-alpha position to increase its lipophillicity, in lieu of the undeclynate ester found in Eq. It's yet another attempt at a non-toxic oral anabolic like Andriol, and it used a similar delivery system. It was sealed in an oil-filled capsule, so that the oil could be absorbed by the lymphatic system just like it is with Andriol and thus it could by-pass the liver and avoid being broken down that way, which is how most oral steroids (the 17-alpha-alklyated ones) are. Your lymphatic system is a bunch of veins and arteries that can only absorb water, the idea behind Anabolicum Vister takes advantage of this state of affairs. Anyway, as you may have heard, using the lymphatic system as a delivery vehicle for steroids is very problematic. Blood levels are all over the place (6)(9), and in some people it seemed as if most of the time it didn't metabolize properly at all. Therefore, as with Andriol, effective doses of this steroid are necessarily high. Originally, each capsule had 10 mg of quinbolone, and you needed to take 10-20caps mg to get any kind of decent anabolic effect (9)(5)(4). Remember, we're talking about oral EQ here, so you're better off with just shooting some nice Stark brand Eq (or Ganabol, or whatever you happen to like). While you won't get any benefits with Anabolicum Vister over regular Eq, it will basically do all of the same things Eq will. This stuff will help you lose a bit of fat (4)(5), will increase strength and muscle (5), and also (as Eq is noted for) increase red blood cell production (2). The kicker, for me, is that this drug was given a new name, Quinbolone, while its basically just boldenone cyclopentenyl. That's just idiotic. As we already know from the properties of the Boldenone base, this is a particularly safe steroid. Anabolicum Vister is not liver toxic (8), and has little or no interaction with the 5AR enzyme (6), so it doesn't really form much of the more androgenic metabolite Dihydroboldenone. We also know that it has only half the ability to interact with aromatase as testosterone, so it won't convert too much estrogen. Unlike it's brother, Methandrostenolone (dbol), it doesn't have the structural alteration of the 17-alpha-methyl group that makes it form a more potent estrogen (6). What we have here (although it has been discontinued) is basically oral Eq, which requires too many caps per day to be cost effective over injectable Eq, but nonetheless may be an interesting drug if a underground lab starts producing some. The original company that made it has, sadly, stopped doing so. 6. Metabolism of 1-dehydroandrostanes in man. I. Metabolism of 17 -hydroxyandrosta-1, 4-dien-3-one, 17 -cyclopent-1'-enyloxyandrosta-1, 4-dien-3-one (quinbolone) and androsta-1,4-diene-3,17-dione (1). Steroids. 1971 Jul; 18(1):39-50. 9. [Clinical study of a new anabolic preparation: Quinbolone] Gazz Med Ital. 1965 Dec;124(12):360-6. Italian.